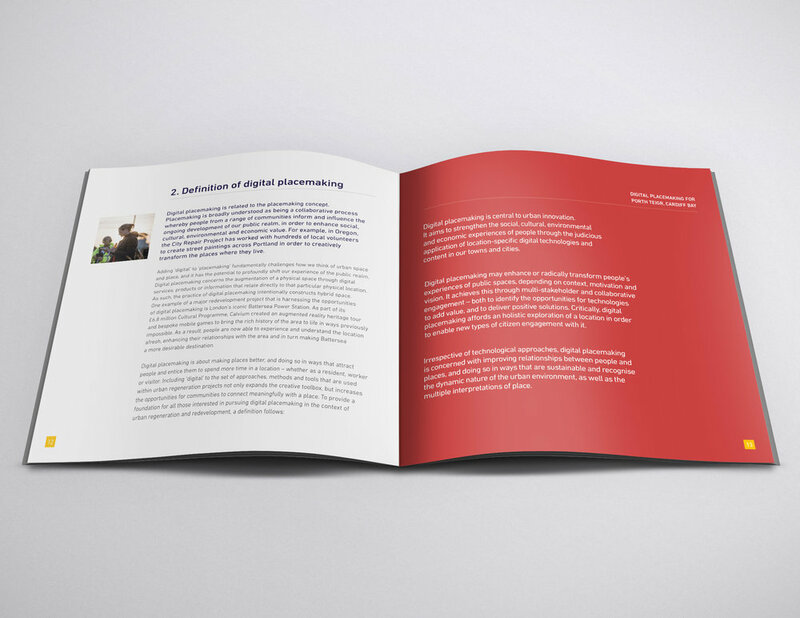 Working with Charlie Harman, Marketing Manager at Calvium and Jo Morrison, Programme Director for Digital Innovation, I was asked to design a brochure report. Calvium specialise in digital placemaking apps, combining digital and physical worlds in order to tell stories and create enchanting experiences. Over the summer, Calvium had worked on a public showcase evening, called ‘Ideascape’ in the Porth Teigr area of Cardiff Bay. This showcase provided the opportunity for people from all walks of life to engage and think about what digital placemaking might mean for the locale. The public were invited to engage with ideas on display – some of which were provided an interactive working prototypes. The report needed to present Ideascape to act as a beacon for all the stakeholder communities involved in urban regeneration, to show how the future of their spaces might be enhanced through digital technologies. Report content took on board feedback from the public covering themes such as community, local economy, skills, wellbeing, heritage and environment. Copy content was written by Jo Morrison at Calvium. I submitted some different design routes for the front cover and inside spreads, building in design development time, with feedback from the client, prior to completing the full design. The report needed to be easily read, but engaging. More like a brochure in style – it was brought alive by professional photography taken at the Ideascape event, as well as deciding to make it square in format, rather than a standard A4 format. 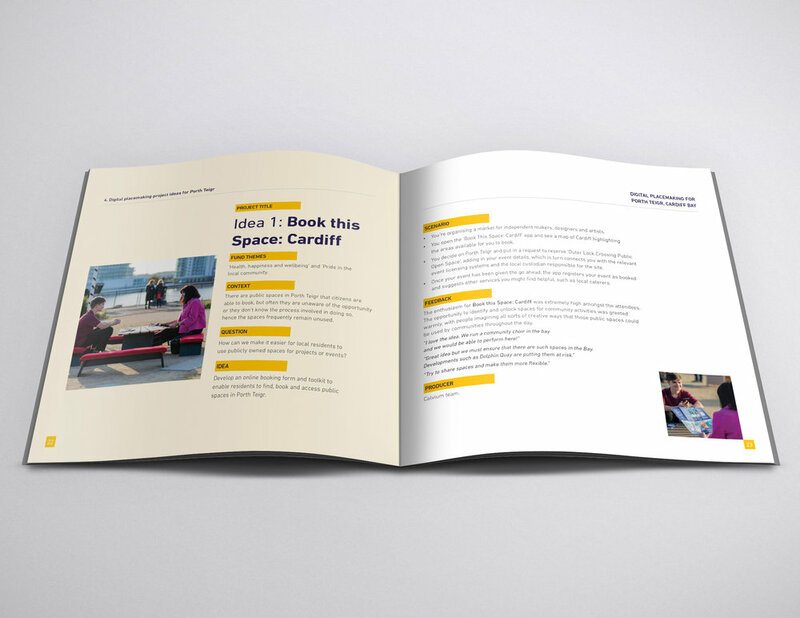 The resulting brochure report was 64 pages in length and printed in full colour. It will be made available as a download on Calvium’s website and presented at a launch event to discuss the Ideascape project and its prospective impact on public digital placemaking.